Fitting a brand new kitchen is not an everyday process and most of us will only purchase a new kitchen once or twice in our whole lives! So it is natural that it can seem to be a bit of a strange process, we have put together a short guide with each stage of the process and how long it might take as a guide for fitting a new kitchen. When embarking on a new kitchen project it is important to ask yourself a number of questions at the outset of the design process. This ensures you achieve a kitchen that looks fabulous and meets all your expectations in its functionality. In this blog post we have focused on some of the main points or questions you might consider to help you get the very best design possible for your home. What is it you like/dislike about your current kitchen? You have to come up with an affordable budget for your new kitchen. There is no point having grand ideas if you don’t have the budget. If you’re limited o budget, there may be compromises when it comes to the final products and furniture you go for, but with a few smart choices, you should be able to attain the main kitchen design you desire. For example, by choosing laminate over granite worktops on an average kitchen you might save £2-£3k, but there would be no compromise on layout. We can help you make the most of your budget, highlighting where to spend money and where to go for the cheaper option. Perhaps you have a large or young family? Or is it more of a bachelor pad? Is there one person in the house who does the most cooking? – Effectively we’re asking whether it needs to be designed around one person’s needs, or whether it needs to be easy for anyone to use. Here you should think very carefully about everything you want in terms of aesthetics and functionality. Perhaps even write the wish list in order of preference to ensure that your main priorities are included. Think about the flow around the room and envisage how you’d like it to work for you. Do you want an island? Sink or ovens in a certain place? Place for your dog? (Believe me, we have designed many a kitchen with a build-under dog bed!) Now is the time to think about what unique design features you want your kitchen to have. You may have a very definite idea on this, for example you’d like a minimalist style with clean lines then perhaps a handleless kitchen would suit you best, whereas for those of you who like a something slightly more traditional, perhaps a Shaker styled kitchen would be better. Do you want to eat family meals in the new kitchen, or simply have somewhere for a chat and a cup of coffee? Perhaps you love entertaining large social gatherings, and want the eating area to be part of your kitchen? All of these things need considering and incorporating into your wish list. What colours do you like? – It’s worth thinking about the size of your kitchen, and the amount of natural light. For example, lighter colours work best in smaller, darker rooms to give the impression of space. Also, are you looking to sell your house soon? If so, neutral colours would be best because they will appeal to more people. The single most important element to get right in a new kitchen is the design. This is the most difficult thing to change because it often involves ripping everything out and starting from scratch. Getting everything right from the start will save you time and money at the installation stage. There’s no need to attempt designing your own kitchen yourself when professionals like us offer free kitchen design services. Designing a kitchen which not only looks good on paper, but also works well in real life is much harder than it looks. You need to speak to a reputable kitchen design specialist (like us), who can help you make the most of your space without going over budget. Give your designer as much information as possible, not only about your room but also your likes and dislikes! Designing the kitchen needs to take place before you call your builder because then they can quote more accurately on the work required. Kitchen units and worktops are almost always designed to be fitted in a room with straight walls and squared corners. It’s worth taking this opportunity to do something about your walls if they’re not up to scratch. The better quality your walls are the easier your kitchen can be installed and the better it’ll look. It is worth noting that painting your kitchen walls will be easier now with no units in the way, although you’ll probably need to touch it up once the units are in. This is where forward planning pays off. If you have a clear plan of where all the units and appliances are going in your new kitchen it is easy to get your plumbing, electrics and ducting in the right places. With electrician and plumbing work for your new kitchen you’ll probably need a first and second fit. The first fit is to get all of the infrastructure in whilst you have no units; this means everything can be neatly hidden away out of sight. Whilst the second fit will be done once all of your units have been installed, this involves connecting appliances or connecting taps. It’s important to consult a plumber or electrician early if you’re moving any fixed appliances or the location of your sink. Delivery of your new kitchen can vary, for a cheap flat pack kitchen from your local DIY store can usually be picked up the same day or within 3 days. Our units come from Germany and are manufactured specifically to your requirements, so we work on a delivery timescale of 4-6 weeks. The units come fully constructed, so you do not have to spend hours putting them all together. The fitting is down to you or your builder, so make sure you spend some time finding the right builder. You not only need to consider price, but also their past projects. Be sure to get references from some of their past customers before you appoint a builder. Often the quality of the units is something which is forgotten. Poor quality units are harder to work with and can take longer to install. After all the extra hassle they create during fitting, they still won’t look that good. At Designer Kitchens for Less we only work with the best manufacturers so you can rest assured that you’re getting the very highest quality available. Plus, we send everything using our own courier, meaning it gets to you in one piece. Generally, we do not advise you build the kitchen yourself, unless you have experience with kitchen installations. Often, it is the experience and attention to detail of the fitter that can be the difference between a beautiful kitchen and one that looks half finished. However, if you do install the units yourself, it’s worth getting in a good carpenter to install the worktops. This is where you’ll really notice the difference between a novice and an expert. If you are having solid worktops i.e. quartz, granite or Corian these will need to be templated. It usually takes 1 to 2 weeks from templating to fitting for solid worktops. After the worktops are fitted the sink and hob can be installed. If you are having solid worktops it is worth asking your installer to put on some temporary worktops these do not need to be anything special just some make-shift boards. It is often possible to get the sink and tap up and running whilst waiting for your new worktops to be fabricated. If you’re having anything other than wood or laminate for your kitchen worktop then you’ll probably need to have it professionally fitted. Getting your granite worktop fitted is a highly specialist skill and not something that you should undertake on your own. You’ll need to speak to a granite installer at the design stage of your kitchen to ensure that what you’re planning is actually possible for them. Also, they’ll probably need to take a final measurement before cutting once the units are installed, so you should plan this into your schedule. Read our ultimate kitchen worktop guide for more information. Flooring is something you can do yourself. However, if you’re having something a little bit more technical then you should find a specialist. For example, if you’re having ceramic tiles installed it may be worth getting in an expert to install them because it’s much harder than it looks. Some people prefer to install the flooring at the beginning of the process, but we always advise leaving it until the end. The reason for this being that you will save money not installing flooring that no one will see under the units. Also, we do not generally advise that you use cheap laminate flooring in your kitchen, this is because moisture and heat fluctuations can make it warp and split at the joints. If you’re thinking of designing or building a new kitchen then give us a call. 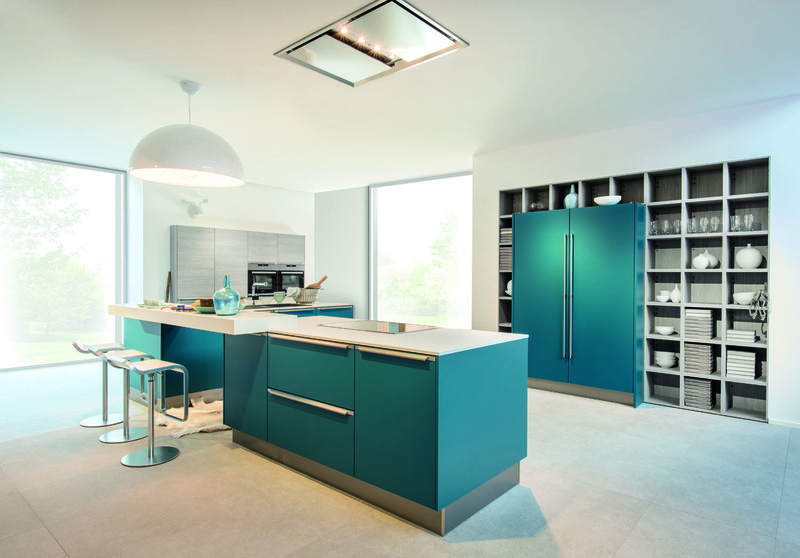 Our design service at Designer Kitchens for Less couldn’t be simpler. Either email a rough sketch with room dimensions or an existing plan to info@designerkitchensforless.co.uk or call us on 01279 504230 for a chat about your requirements. Our designers will work with you to refine your plan and provide you with a very competitive quote. We can guarantee you won’t find such high quality at our competitive prices anywhere else!